Here's a story from classic literature that almost everyone is familiar with, thanks to Disney animation. And in this case, good old Walt didn't veer too far from the Washington Irving's original 96-page short story. It's such a deliciously quick read, you could polish the story off almost as quickly as you could watch the Disney short with velvet voiced Bing Crosby as narrator. But you'll like the book even better. 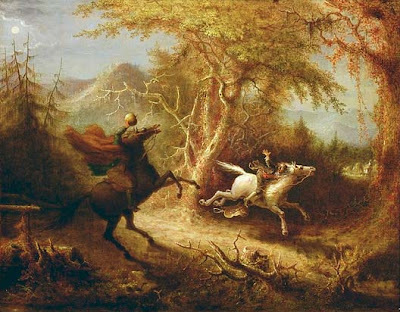 And strangest of all, the Headless Horseman, was based on a local area legend. If you remember from your American History classes, during the Revolutionary War the English hired German soldiers to finish off the dilapidated American army. (You can read about Valley Forge to see how that turns out.) The legend implies that one of the trained Hessian soldiers was beheaded during battle, and now the phantom wanders the woods near Tarrytown, searching for a "replacement." Bits of local legend and true to life characters are combined in a tale of romantic rivalry, frightful suspense, and wild moonlit chases. I won't tell you how it ends...but I suspect you already know. And once you know, you can never walk calmly towards a covered bridge again. Our treat to eat while reading is a Reese's pieces studded peanut butter cookie. If you can find the miniature Reese's pieces in your baking aisle, they provide a pleasant little crunch and a teensy jolt of extra peanut butter flavor. They're just the kind of cookie to enjoy with a spooky story tonight, under the full moon, in the safety and comfort of your own home. Money Saving Tips: Full sized or miniature Reese's pieces (about $2.50 for a 12 ounce bag) will work work well here. If you wait till after Halloween, you might even be able to steal some of the candies from your children's stash. Peanut Butter is a great item to have around for food storage, since it's high in protein and keeps for long periods of time. When it goes on sale, buy a few extra jars. I buy the smaller jars since we don't get through it very fast. Notes: I was a little too stingy with my Reeses's pieces and only added about 3/4 cup. Preheat oven to 375. In a small bowl, combine flour and soda. In a large bowl, beat butter and sugar until creamy. Add the egg, peanut butter, and vanilla, stirring until well combined. Mix in the flour mixture. Add the Reese's pieces. Form into 1 inch balls and place on cookie sheets. Bake for 10-12 minutes. Those cookies = marvelous. Peanut Butter is my favorite cookie variety!! Yummy! I love the salty-sweet of PB cookies. This post reminds me of the "Spooky Hallway". :) I went to get out our spookiness and that's when I found the dead, furry, spooky thing. Our spookiness is on hold for a little bit until daddy can get it out. Double peanut buttery goodness in these cookies! They look excellent! We used to read the Legend of Sleepy Hollow when I was little. It has been awhile, maybe I will get it out this year for fun! I like Washington Irving. Heck, who couldn't love a guy who dreamed up a 20 year long nap? I think that's every teenaged boy's dream! Your cookies are beautiful, as usual. I feel like a baking slouch! I am loving your book highlights! You are making me want to cook up a storm and curl up and read a good book! Now I want to watch Disney's Sleepy Hollow! I could kill two birds with one stone and watch the Disney Movie again and bake the cookies at the same time! You know how I love Peanut Butter!! Are you reading my mind? No, really, are you? I am in the midst of trying to come up with a peanut butter cookie that I can use chopped bits of Reese's mini peanut butter cups rather than the reese's pieces... I saw your title and it was like you were reading my thoughts! I have forgotten about adding in Reese bits to pb cookies. :::sigh::: those look so good. Another great cookie and with mini Reeses Pieces! Yum. That little disney short of the headless horseman always scared me! But, maybe the book wouldn't be as bad?! Prudy, I am so enjoying your Cookie Bookie week! It's getting me in the Halloween spirit for sure! You've pick a great story today; this one still kind of creeps me out. That whole "headless" aspect of it. And when I'm scared, I eat. So if I'll be eating anyway, it might as well be these wonderful Reeses peanut butter cookies! Thanks for your comment this morning -- I'm glad my comment yesterday gave you a chuckle. I am always worried that I get a little long-winded with my comments. Most people seem able to make their point succinctly in a sentence or two. I seem to need page numbers in mine. I guess your posts just inspire me that way, Prudy! The cookies look delicious! We just made your whopper cookies and loved them! I love to read the Legend of Sleepy Hollow in October, too! I have such a weakness for these little candies, they are one of my faves! Love these cookies! I picked up Twilight today, can't wait to read it! Great cookie choice! Love those Reese's Pieces for the added peanut butter flavor. I wish I had one of your cookies right this minute. I'm starving! I like what someone wrote about who wouldn't love an author who let a guy sleep for twenty years. Great post. Love the books. I love salt and sweet together so these cookies make me very happy. My kids, especially my PB loving son would love these. I need to read this book again - it's been years. That story always freaks me out! Your cookies look wonderful though. You have the best stories! I love the legend of sleepy hollow stuff. But I cannot EVEN believe you would stoop to thievery - stealing your children's stash after Halloween in order to make those delicious cookies! Well I guess a mom has to do what a mom has to do. (I've been known to steal a little candy myself from the kids, but I'm not telling anyone but you about that!). I want a peanut butter cookie right now! Love the Legend of Sleepy Hollow!! Peanut butter cookies with peanut butter pieces, sooo good! Your cookies look delish! I love the story of Ichabod Crane. My 2 year old loves to watch the Disney animated movie, however...it's over just before the headless horseman makes an appearance. I don't think his 2 year old eyes are ready for that...or I'm not ready for sleepless nights! Love your Cookie Bookie week idea. thanks! I saw your cookie on Serious Eats! Nice :) Reese's are my favorite candies. In a cookie? YUM. I'm going to have to read the last book you mentioned. I think I've read some short stories by Edith Wharton. You can't beat a ghost story that takes place in an old, haunted house. oh, erin! these look divine! kimball is reading that book right now and i am thinking about using it as our read aloud on the week of halloween. the cookies can't wait that long, though. Yum, I love peanut butter anything! These look really good and you use half whole wheat? I'll have to try it, too. I love cookie week. It's making me feel like the cookie monster though--it's all I can think about! Oh, Prudy I loved this post! I loved learning about Washtington Irving. It was very interesting. I love this Disney movie but can you believe it I have not read this book! I've got to go to the Library tomorrow and I will make ever attempt to remember to get this book! Your cookies look so delicious and fallish. Can't wait to make these ones. The kids will love them. Not to mention their Mother. i love how u have the cost of how many cookies! those cookies look delicious! Reminds me, I could use one of those 20 year naps. My wife cooks up the peanut butter cookies. Never had them with Reese's Pieces. Guess we'll have to give it a try. I a loving this week's posts. The books all sound great, and so do the recipes. In true Pennywise fashion - two for the price of one! Love the cookies and The Legend of Sleepy Hollow is one of my favorites but I didn't know all the history behind it. Great post! I'm really enjoying cookie bookie week, it's really getting me in the mood for halloween! 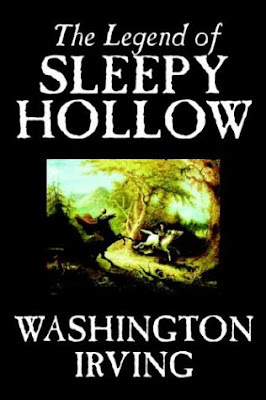 Legend of Sleepy Hollow - you are bringing back some wonderful reading memories. Your cookie look top notch. Those are identical to the pb cookies I love the most! I have to go and get a spooky book so I can grab on or 10! Hmm.. I might have to make these for my peanut butter junkie of a husband. They look wonderful! Hey! A book I have read! I loved this short story and the cookies look great. I do have some Reeses Pieces left over, I will make them for my boys on the weekend. This is too much! I've already got a spare 5 to lose from before, now a spare 10 from the trip and I'm staring at cookie after cookie! Makes me want to be naughty! This cookies looked so good, but I tried them several times and they turned out... not so good. I'm a fairly experienced baker and followed the recipe, still with unsatisfying results. I don't mean to be mean here. Perhaps more butter in the base or another egg would do the trick. Also, stick with the smaller amount of reeses' so the batter can hold onto them. Unfortunately, I will not be looking at this recipe again.